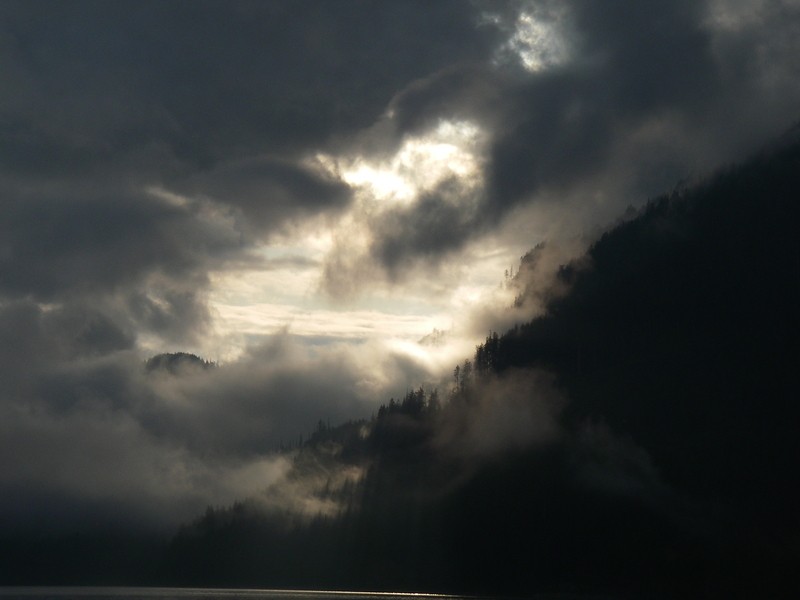 I love running up Knight Inlet in the morning as every morning offers something special and this was one I really liked. 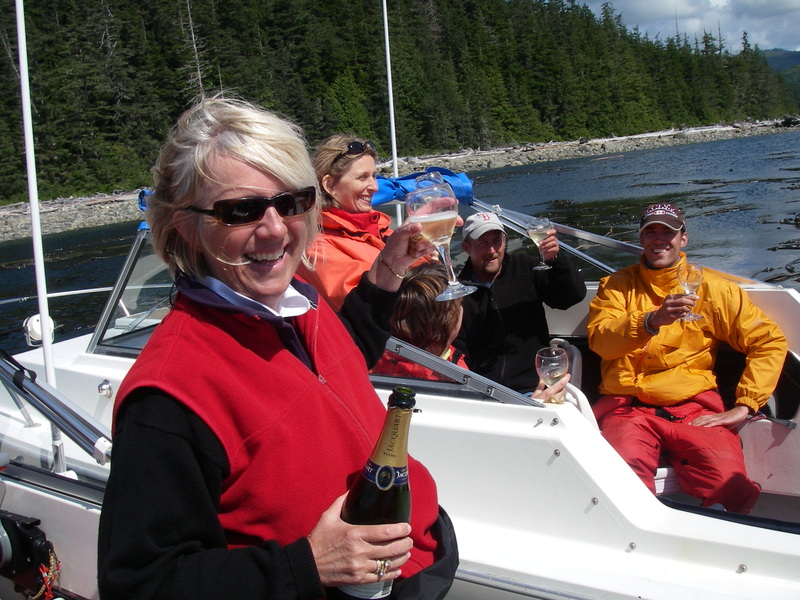 The run up the inlet to where we watch the grizzly bears is just over an hour and this photo was taken at the start on the run and was special for two reasons. First that I like clouds and cloud formations especially with the dark cover and the sun starting to show through. Second that sun was shinning on the valley that contained the Glendale River which was our destination so I knew we had a great day ahead. 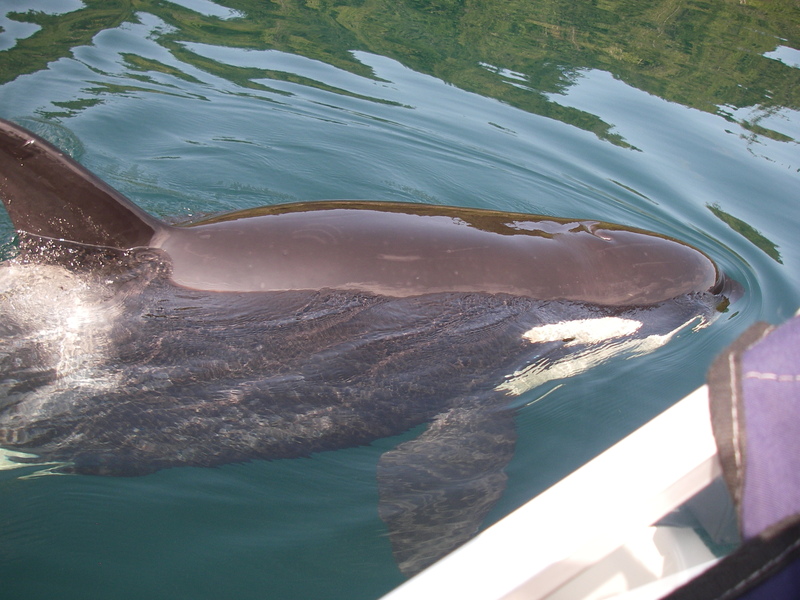 Pacific white-sided dolphins are often encountered on tours from Grizzly Bear Lodge. 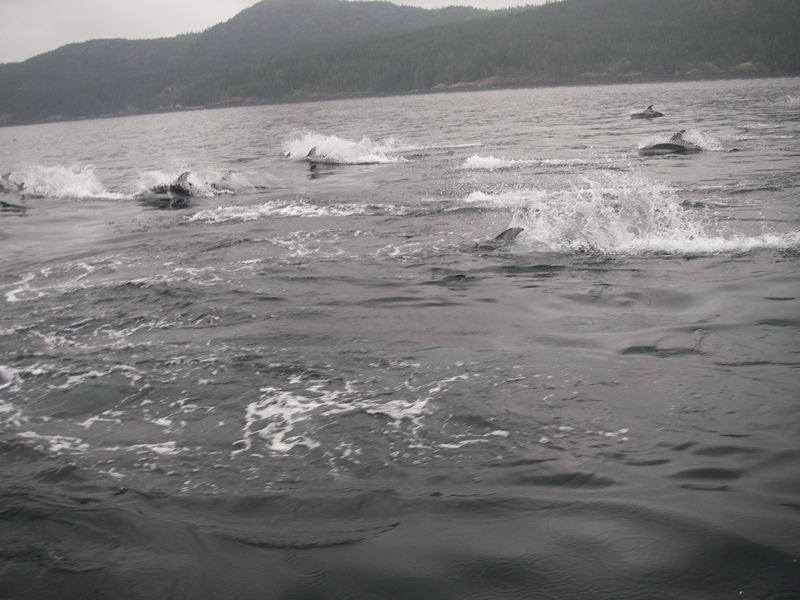 Grizzly bear tours or whale watching safari each have an equal possibility of coming across a pod of dolphins. 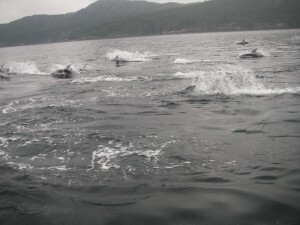 Dolphins are playful and enjoy riding the bow wave and the rear wake of the boat. The best advise is to point and shoot and take as many pictures as possible and maybe a dozen or so may even contain dolphins and not just water and one or two of those may be good pictures. The pods range in size from several dozen to over five hundred and the more there are its seems the more playful the dolphins. There is a marine regulation requiring boats to stay 100 meters from orca and this is enforced by Strait Watch and the Warden. This day we were lucky to be sitting quietly as the orca were passing in shore of our boat when a female turned and left the pod she was traveling with and swam around and beneath our boat. 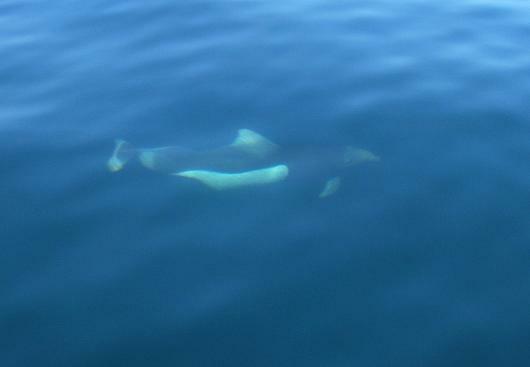 The lucky part was that Strait Watch was sitting about fifty meters from us so we had the best witness that we were not approaching the orca. Were we talking with them after the encounter and both agreed that the orca was likely fishing and approached our boat out of curiosity. The reason is not important the photos are what counts. Definitely a bonus day. Two views of Trapper Rick’s Kakweikan River. The turbulent and fast water below the falls less than one hundred meters from Rick’s cabin and visible form the deck and the slow moving peaceful river adjacent to the cabin. Both parts of the river attract fishermen (sorry I just can’t be politically correct an use the term “fishers” as that refers to a weasel like animal and not someone enjoying themselves on a river bank) and women even though they may have never put a rod in the water before. 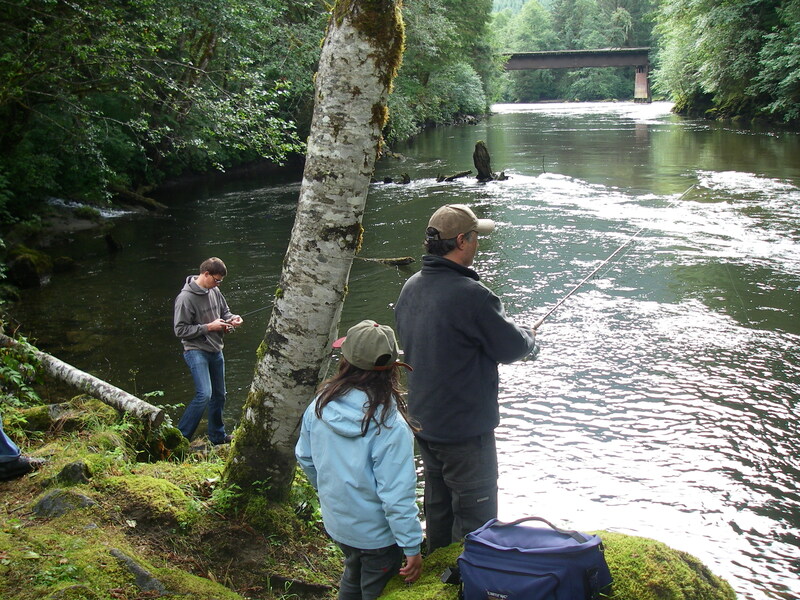 From late July through September the river is full of pink salmon and coho and guests cannot resist just one cast and then “fish on” and they are hooked. It could be what is known as “fishing in a barrel” the only saving grace for the guides is that the river is “catch and release” so no fish come home to be cleaned. The first evening at the lodge, if the tide is low enough, there is a local boat tour looking for black bear, bald eagles and other wildlife. The black bears come to the shore for food high in protein and this is made up of crab, clams, barnacles, mussels, amphipods and other tiny invertebrates. 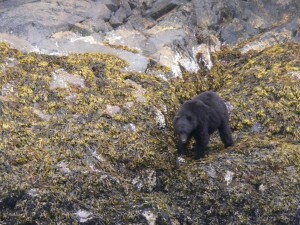 In this case the bear would use its claws to scrap the barnacles free to the rocks and eat them including the shell. From the size of this bears belly it is in pretty good shape for the coming winter and the photo date in only July. Black bears do not have access to the salmon rivers because of the number on grizzlies in the area so they cannot rely on a sudden food source in September to gain hibernation fat and must work hard all spring and summer if they want to survive. Grizzly bears are omnivores (everything-eaters) because they eat a variety of plant and animal foods and tend to be opportunity feeders. 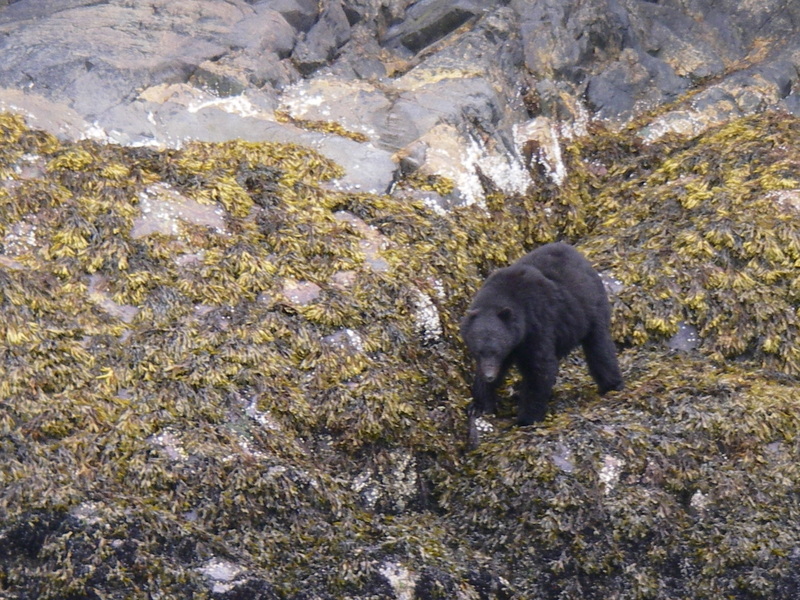 On the coast of BC, beginning in the spring, the bears feed on early green vegetation such as skunk cabbage and sedges located in the estuaries and that appear first. Bears access the food in the inter-tidal waters at low tides to and their great sense of smell helps them locate carrion. Even thought grizzly bears can run in an excess of 30 mph about the same as white-tailed deer they are not quite as agile. The deer keep a comfort zone between themselves and the bears while the bear’s weight the energy required to possibly catch the deer with the chance of success and rarely give case. Yes it is safe to viewing grizzly bears from boats. We travel up Knight Inlet from Grizzly Bear Lodge to the Glendale River and transfer to a sixteen foot flat bottom skiff to make the bear watching easier, however the boat is still faster than a swimming grizzly. 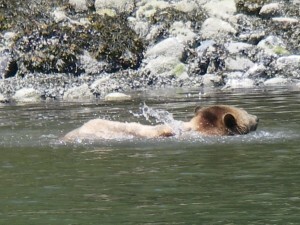 This July grizzly is cooling off and enjoying a swim along the shore. From the amount of its body above the water line it has already put on a good deal of fat just eating the sedge grass along the shore as well as Turing over rocks at low tide. 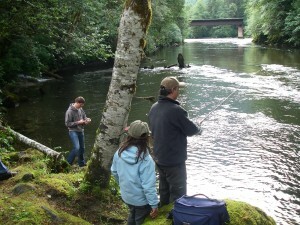 The abundance of berries at this time of the year are also a help ad they wait for the salmon to return to the river. 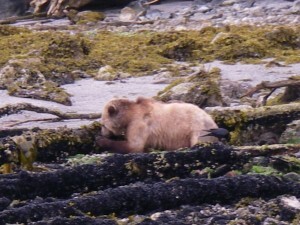 Everyone benefits when grizzly bears come to the beach at low tide. This bear is having a meal of mussels it scrapes off the logs. Any bits and pieces the bear leaves provide an easy meal for the crows, which are always close. Turning over rocks also uncovers many sand fleas and lice that the bears may overlook but not the crows. Not a good photo but a good story. 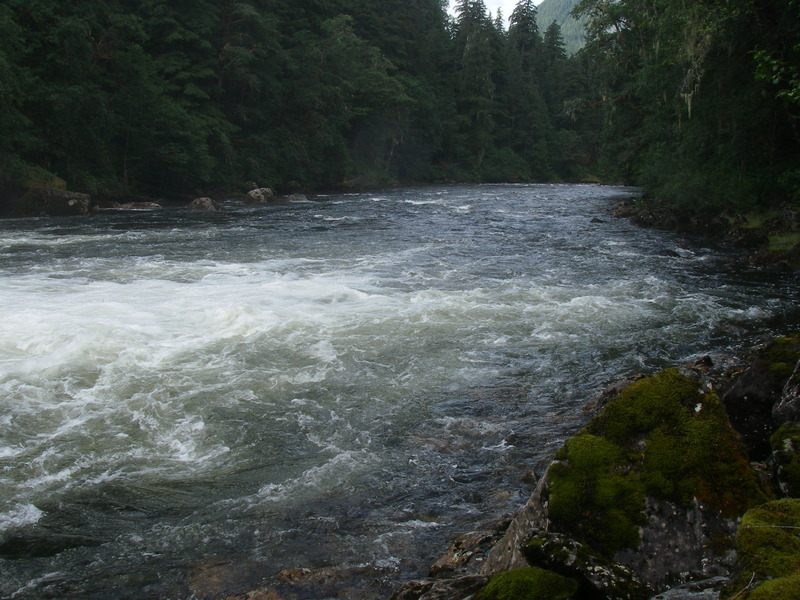 If you are visiting Grizzly Bear Lodge for the extra day if is normally spent with Trapper Rick on the Kakweikan River which is a forty-five minute boat ride from the lodge then a twenty minute ride over logging roads and then a ten minute hike to the Trapper’s cabin. As a guide we ride in the back seat of the truck so this is a photo, through a windshield, of a large male grizzly bear walking down the road in front of the truck. We paced this grizzly for about three miles and it stayed to the middle of the road occasionally looking over it’s shoulder at the truck and even turned off the main road to take the same one we used to get to the river crossing to Rick’s cabin. 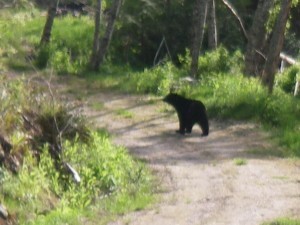 We waited in the truck giving the bear time before we left for the cabin. So yes we do see grizzlies while visiting the Trapper. Dall’s porpoise are the fastest cetacean in BC, at speeds up to 55 km/hr and like dolphins they will often play around the boat. 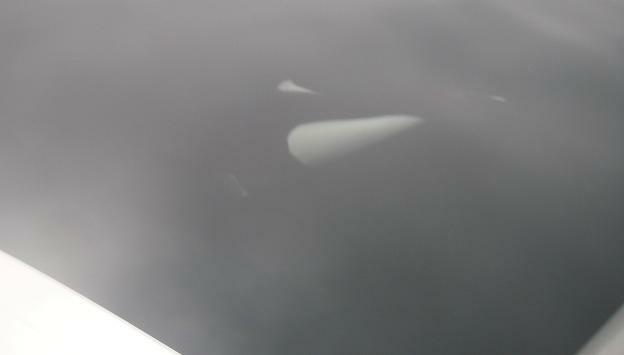 The white in the corner of the photo is the edge of our boat. Dall’s are found only in the North Pacific Ocean and adjacent seas (Bering Sea, Okhotsk Sea and Sea of Japan). They range from coastal waters to deep offshore waters. Details of migrations are poorly known, however, Dall’s porpoise are year-round resident though-out much of their range, generally moving north for the summer and south for the winter. Dall’s porpoise feed mainly on small schooling fishes (herring, anchovies, mackerels and sauries) and cephalopods (octopuses, squid, and cuttlefish).